“Fame” began as an Academy Award-winning film, then became an Emmy-winning TV series and then on to the stage as riveting musical theater — all conceived and developed by David De Silva. 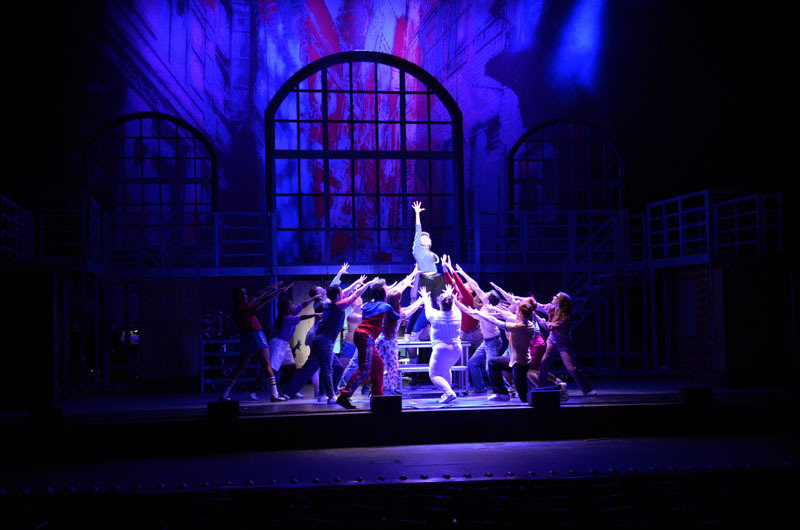 “Fame — The Musical” brings the glitz and glamour of stardom to Folsom’s Harris Center for the Arts Friday, Jan. 13, at 7 p.m., Saturday, Jan. 14, at 2 p.m. and 7 p.m. and Sunday, Jan. 15, at 2 p.m. The show follows the final class of New York City’s celebrated High School of the Performing Arts from their admission in 1980 to their graduation in 1984. Having survived the auditions and been chosen from some 4,000 who applied, only 97 were admitted. All of the struggles, fears and triumphs are depicted with razor-sharp focus as the young artists navigate the worlds of music, drama and dance. The superb music and dance numbers tell a story that is intertwined with personal relationships as young performers strive to grow and develop their talent. Driven, thankful and competitive, each character seeks to make their own big splash in the glamorous performing arts world of music, dance and theater. “Fame’s” journey from film and TV into theater is a story unto itself. Despite the success of “Fame” on both the big and small screens, De Silva’s heart was on the stage. So instead of doing something else after “Fame,” De Silva — also known as Father Fame — embarked on a completely new version of the project (with composer Steve Margoshes and lyricist Jacques Levy) that would take him eight years to bring to completion. “When I conceived and produced the motion picture ‘Fame,’ I always imagined that it would be the ultimate reality-based stage musical. There’s a logical reason for the kids to be performing because it’s part of their daily lives. They don’t just burst into song out of the blue,” said De Silva. Unlike “A Chorus Line” and “West Side Story,” two of the shows that most inspired De Silva’s creation, “the show allows every choreographer to put their own stamp on the production. The dancing is a mixture of Broadway, modern, street and classical. The mixture of styles is as diverse as the characters who come from different parts of New York City.” De Silva’s vision — “Fame — The Musical” — has reached some 60 million people in over 30 countries with the last tour of the musical occurring in 2003. Tickets are priced from $45 to $79 and are available online at harriscenter.net or by calling the Harris Center ticket office at (916) 608-6888 from noon to 6 p.m. Monday through Saturday and two hours before showtime. Parking is included in the price of the ticket. The Harris Center is located on the west side of Folsom Lake College campus in Folsom.